Warren Ellis is an amazing comic book writer whose career has spanned DC Comics and the Marvel Universe and independent comics companies. He wrote Red, which became a hot Bruce Willis action/comedy movie so successful a sequel is coming out. He’s one of those writers whose every move is watched by comics fans and Hollywood (though it seems like those two groups are closer than ever to converging and becoming one). I knew he’d become a novelist as well. I bought Crooked Little Vein when it came out, but for some reason I never got around to reading it. 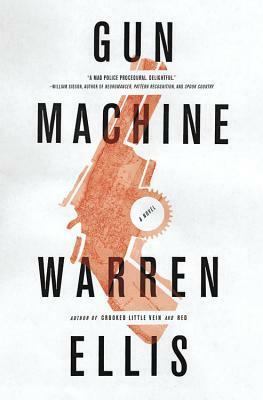 His second novel, Gun Machine, just seemed fascinating to me. I mean, a whole apartment filled with guns that had each been used in an unsolved murder? And the fact that the guns were set up in some weird symbolic pattern? Well, that was a story I couldn’t stay away from. I opened the book and barreled through the pages, trying to stay one step ahead of John Tallow, a Sherlockian kind of investigator who had just watched his partner get blown away in front of him. Ellis has got this way of taking a strange character and making readers like him/her. At least, his fans do. And Ellis also has a way of thinking outside the box that just grips the imagination in an ultimate fighter cage match death grip – just will not let go. Ellis is twisty and wry and yet all-too human in his revelation of characters and events. Granted, Tallow, Bat, and Scarly stop somewhere short of being fully fleshed characters, but they’re deep enough that I felt like I knew them even though I didn’t know much about them or who they had been before the novel revved up. There’s just enough of them to hang a hat and coat on, and nothing to get in the way of the plot and the action. Ellis winds his plot up to an unrelenting pace and the pieces are elegant clockwork when he begins to pull the mystery apart. I kept guessing as to what was really going on and what everything meant, but I didn’t get it all figured out. When the solution was laid out, though, it made perfect sense. There are a couple places where Ellis gives his characters and plot a nudge in the right direction, but everything else is done so well that I truly didn’t care. I noticed it, then went right on turning pages because I couldn’t quit the chase. I don’t know if Ellis plans to write another novel about John Tallow and company, but I’d definitely pick it up if he did. This is a great little novel that will satisfy crime readers in a variety of ways, especially by kicking some variety into the mystery/suspense arena. This entry was posted on January 27, 2013 at 2:09 am and filed under Audiobook,Comics Related,Crime,detective,Suspense. You can follow any responses to this entry through the RSS feed.